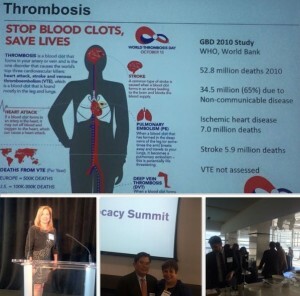 President/Founder of The Research Group and Observation Baltimore, Barbara Gassaway, was recently the kick-off speaker for a day-long VTE summit sponsored by the Bristol Myers Squibb – Pfizer Alliance in Cardiovascular Advocacy. Experts in the field of Thrombosis Medicine presented current VTE insights. VTE is a commonly occurring condition and can be deadly. In the United States and the United Kingdom, VTE kills more people than AIDS, breast cancer, prostate cancer, and traffic accidents combined. For more information, read The Research Group’s article, This is Serious! This entry was posted on Wednesday, April 29th, 2015 at 9:16 pm. Both comments and pings are currently closed.